So, I did some MAJOR shopping during the memorial day sales! I went to J Crew, J Crew factory, Nordstrom, Urban Outfitters, Madewell, American Eagle, and a few other places! I literally went crazy. It was bad. But amazing. I have no regrets. So here is a blog haul for you to show you most of the things I got! Some of the things I'm not sure if I'm keeping or I'm getting them for my birthday (which is June 19th! ), and some are not summer appropriate so I will show you the other things later. 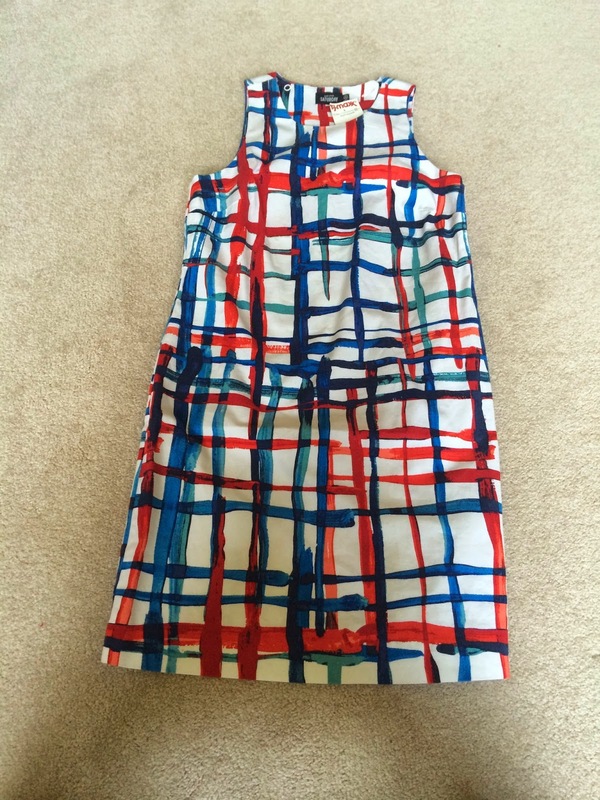 Dresses: These two dresses are going to be great little summer dresses. I am obsessed with this pineapple dress from the J Crew factory outlet. It has a sweetheart neckline then some thin adjustable straps. Kind of similar is this navy and polka dot dress from Urban Outfitters. This dress was only about $15-$20 so I couldn't pass it up. 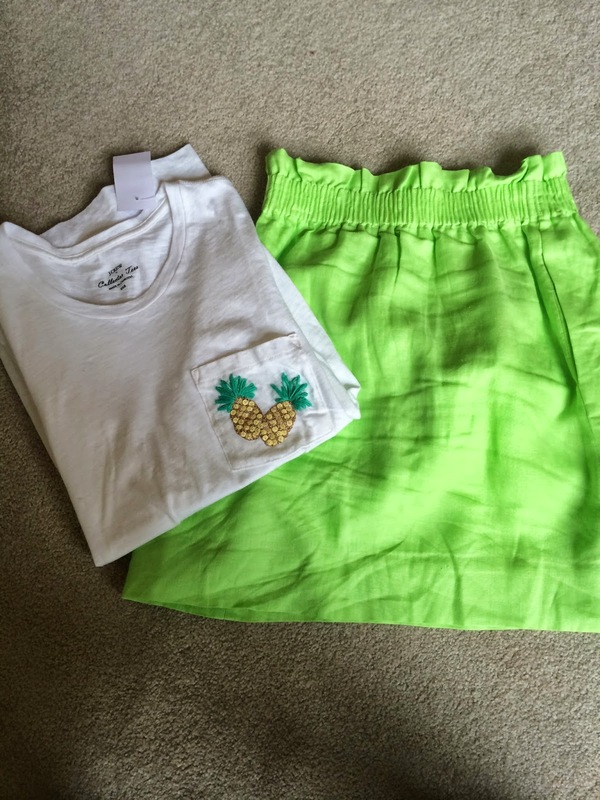 Skirt and tee: I picked up an ADORABLE pineapple tee (you see the addiction is real). I can't wait to pair this with a simple pair of shorts for an easy summer look. 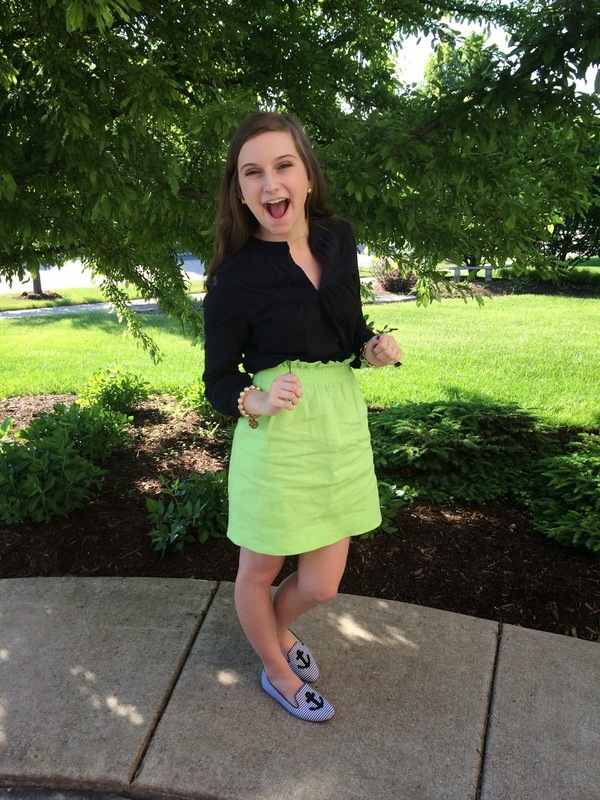 Then this lime green linen skirt I picked up from J Crew and it ended up being pretty cheap. J Crew had 40% off their sale section so I got a lot of good deals there. 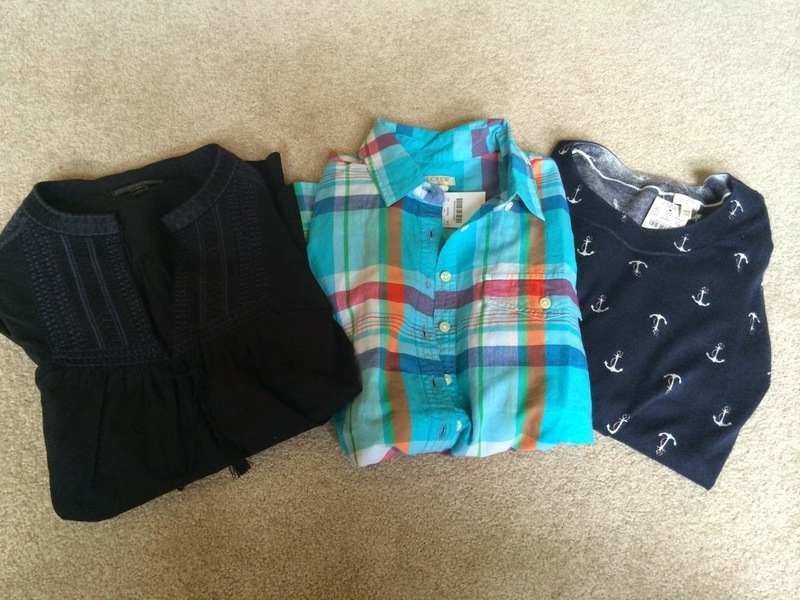 Shirts: Next I got a tunic, plaid shirt, then an anchor sweater. 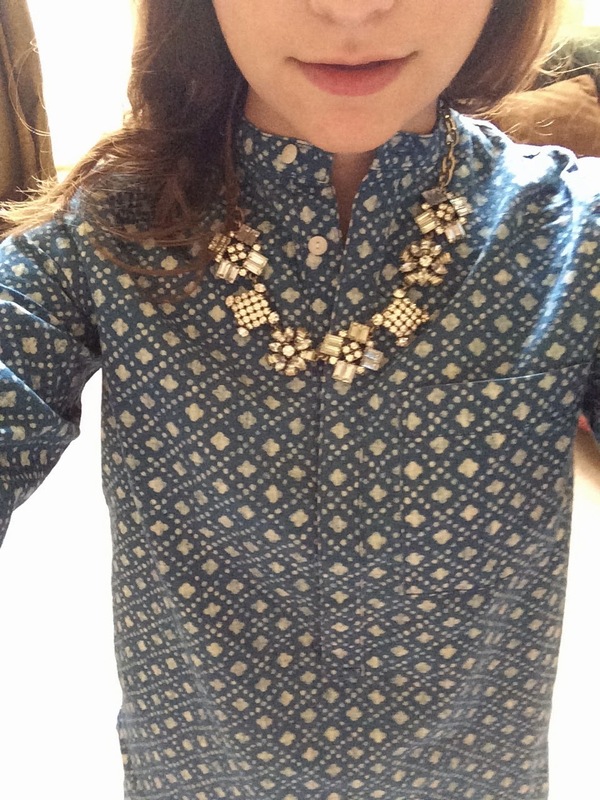 The navy tunic is from J Crew then the other two shirts are from the J Crew factory store. Crop top and shorts: Both of these things were from American Eagle. With their sale section 60% off both of these pieces were under $10 each! So these were a great find. Chino shorts: I have been in desperate need of some chino shorts. So I got three pairs form the J Crew store. The two neon pairs were about $20 then the white ones were full price but I need them for recruitment! The neon green and white ones are 3 inch and the hot pink ones are 5 inch I believe. 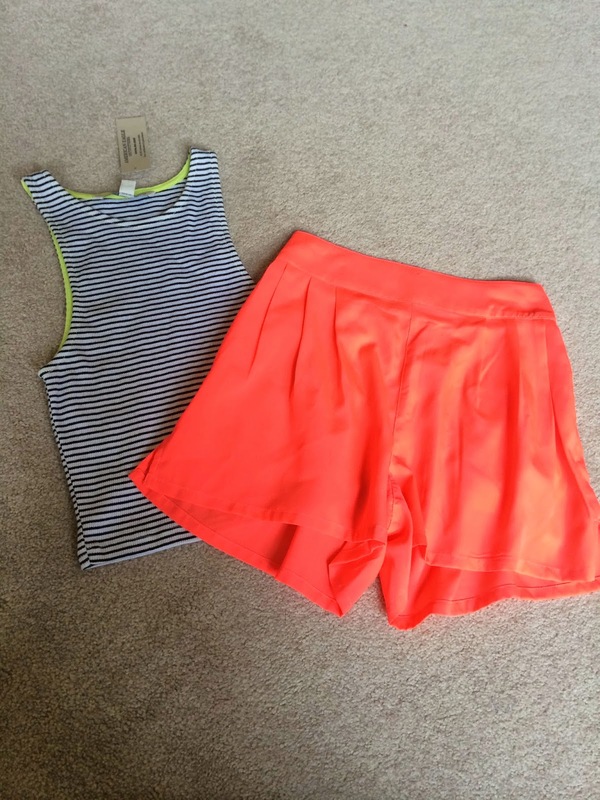 Shorts: These two shorts are from Urban Outfitters. They were both under $15 which is such a steal. I love the scallop detail on the black lace shorts. It gives them an extra girly touch. 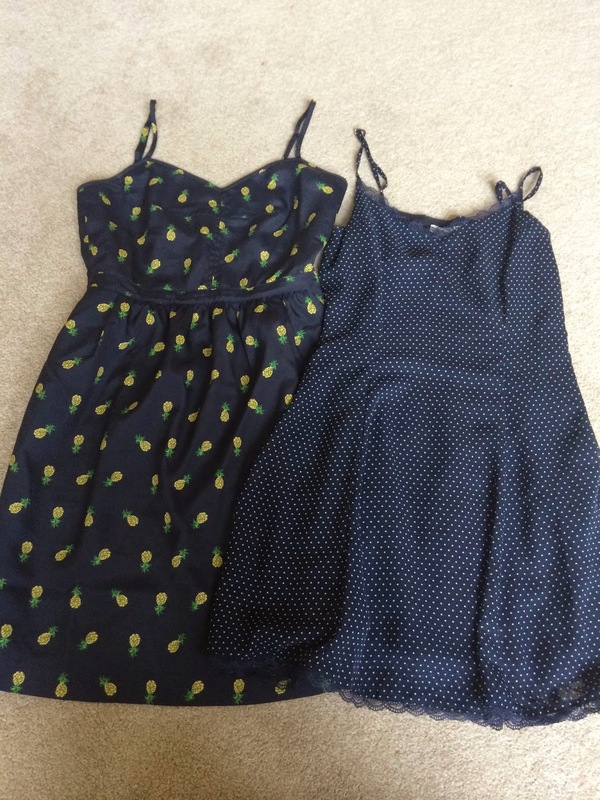 Dresses: These two dresses are also recent purchases but not really from Memorial Day sales. The dress on the left is from TJMaxx but is a Kate Spade Saturday dress. You can probably picture me in the store silently freaking out so I went to try it on and it fit perfectly. 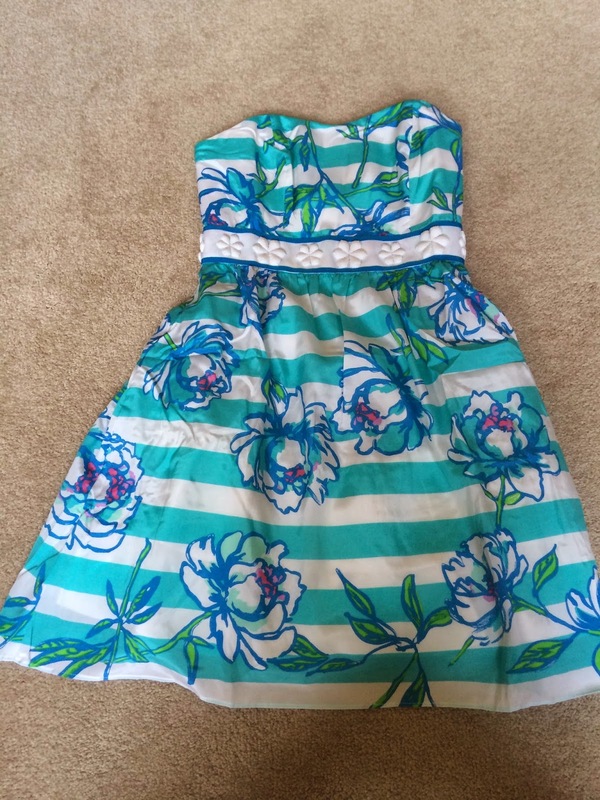 Also, I got a Lilly Pulitzer dress on sale during a Rue La La Lilly sale. It was a pretty good deal as far as Lilly Pulitzer goes and since I can't go to the warehouse sale that will have to do! Scarves: Both of these scarves ended up being around $7! 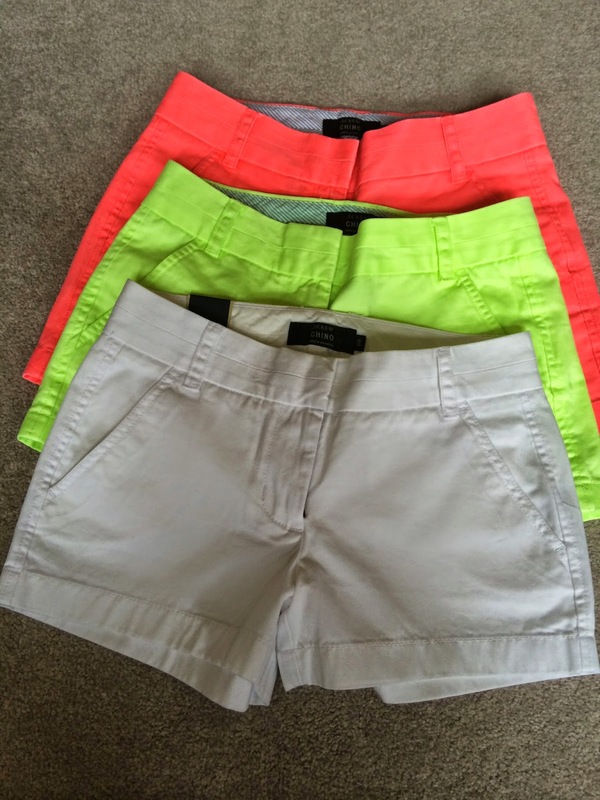 I love the white and neon one and will be great to pair with my neon chino shorts. 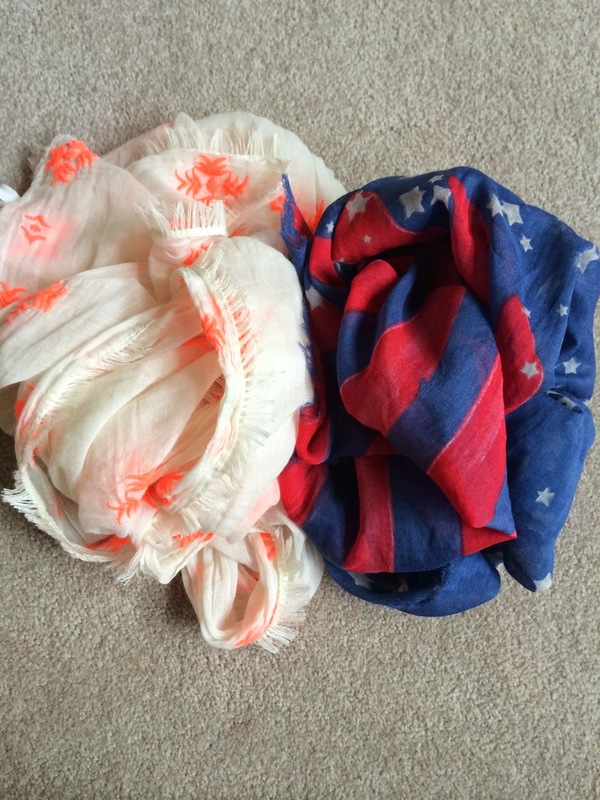 The red, white, and blue American inspired scarf will be great for 4th of July or when I'm feeling patriotic. These two tops are new as well! 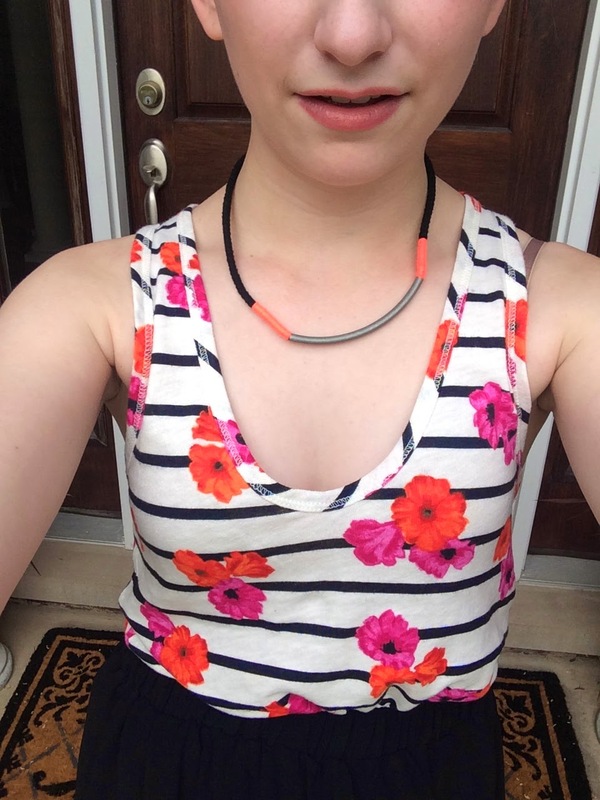 The striped tank was only $10 at J Crew outlet. Then the denim tunic is form Madewell and was around $19! Also my statement necklace is new. I got it at the J Crew outlet for only $15. New shoes and bag. 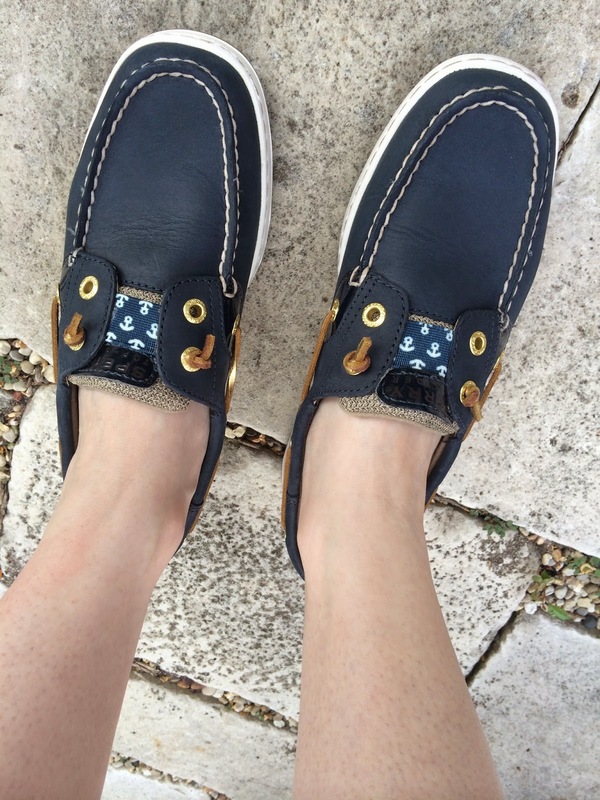 New navy Sperry Top-Siders are from Nordstrom and were around $50 I believe. 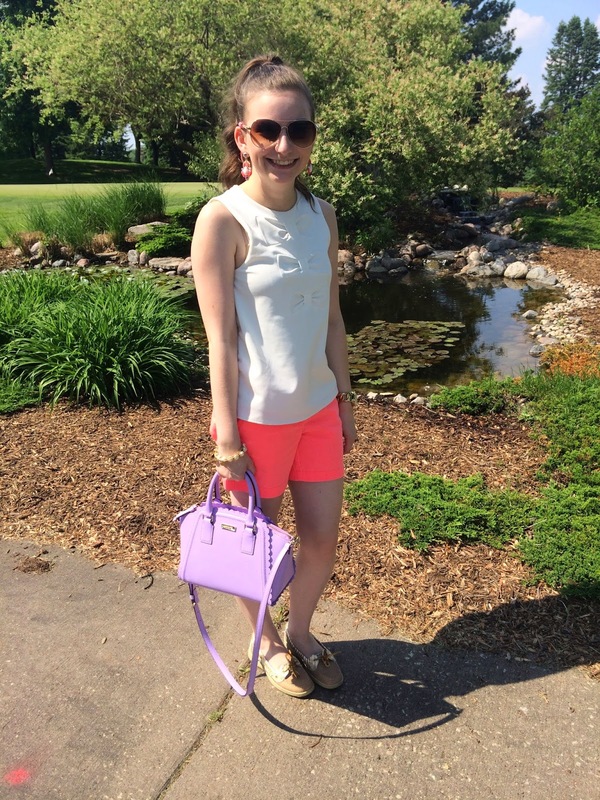 Then you have seen my new purse that I picked up from the Kate Spade outlet! Got a great deal on it and I'm obsessed.